Tag line: "From the Most Popular Mystery Romance since Rebecca!" 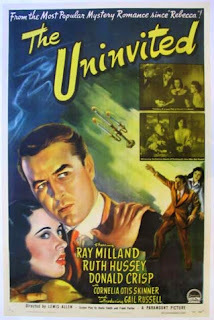 Any list of great haunted house films from the black and white era wouldn’t be complete without 1944’s The Uninvited, which tells the story of Roderick (Ray Milland) and Pamela Fitzgerald (Ruth Hussey), a brother and sister who fall in love with a beautiful house in the coastal town of Cornwall, England. To their surprise, its owner, Commander Beech (Donald Crisp), is only too happy to sell, which upsets the Commander’s granddaughter, Stella (Gail Russell), whose mother died there. The Fitzgeralds quickly move in to what they believe will be their dream house, and even invite Stella over for a visit. But when a ghostly presence makes itself known, Roderick and Pamela are forced to deal with the fact that their new home is haunted. Like any good ghost story, The Uninvited relies heavily on its atmosphere, the feeling that someone (or something) is always watching from the shadows, quietly observing every action, every conversation. There are moments of genuine horror, like when Roderick and Pamela are awakened in the middle of the night by the sound of a woman crying, but for the most part, it’s the film’s ominous mood that will have you squirming in your seat. Along with the scares, the movie is also an engaging mystery, yet not in the same vein as films like The Haunting or The Legend of Hell House, where the mystery (at least initially) stems from whether or not an actual supernatural event is taking place. In The Uninvited, the Fitzgerald siblings accept that their house is, indeed, haunted, and they want to know why. A number of solid ghost movies have hit the scene in recent years, including The Innkeepers and The Woman in Black, and in the late ‘90s, films like Stir of Echoes and The Sixth Sense had the hairs on the back of your neck standing at attention. Yet when it comes to spooky dwellings, nothing can beat the black and white classics, movies like The Haunting, The innocents, House on Haunted Hill, and The Uninvited. Some horror films lose their effectiveness over time, but these four are just as creepy today as when they were first released. I'll make this short and concise... I LOVE this movie! I, too, wrote a review about it!